Imagine being 29 and unable to leave your country. Iranian Nassim Soleimanpour dissects the experience of a whole generation in a wild, utterly original play. He turns his isolation to his advantage with a play that requires no director, no set, and a different actor for each performance. 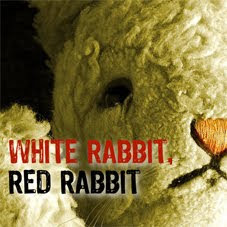 Volcano Theatre co-produced the world premiere of White Rabbit, Red Rabbit in 2011, shown simultaneously at SummerWorks and Edinburgh Fringe Festival. It is now playing around the world. "It takes you by surprise because it is so funny and silly at the start," said [Tom] Basden, "and then things start to develop which are quite surprising and dramatically interesting: at the heart of it is the idea of someone trying to speak through someone else and the question of what censorship means." Juliet Stevenson: "It is unlike anything I have ever done before but I like jumping out of the comfort zone - it is good to do something that is a bit scary...Plus I have the perfect excuse if it doesn't go well...because I can say that I am under-rehearsed." "Having the actor not see the script beforehand gives you a profound sense of the writer's voice in the room," explained [Chris] Haydon [Gate artistic director]. "The spontaneity of an actor reading a script for the first time and discovering it with the audience gives complete authority and power to the writer's voice, and the way that voices control people is an intrinsic theme in the play." "Look at these beautiful e-mails I'm receiving. Look at this blog. An audience e-mailed me and asked me if this blog is a part of the play. He thought the interaction between me, my actors and the audience is still running in the net and it was planned beforehand in my play. I said: I don't know. This is not me who is writing this play, not anymore."